Are you beach body ready? Do you want a simple 5-step routine to get that beach body everyone is talking about? Why haven’t you got a beach body yet? How dare you not conform to the standards and try to turn yourself into a size zero airbrushed and photoshopped model wearing a bikini! The idea of having a “beach body” or being “beach body ready” is just a manufactured concept to sell bathing suits or diet pills, or protein shakes. Here’s the only genuine way to be beach body ready: take your body, put a bikini on it, and go to the beach. Done! If you, like us, are sick of this trend then you will love the image shown above. 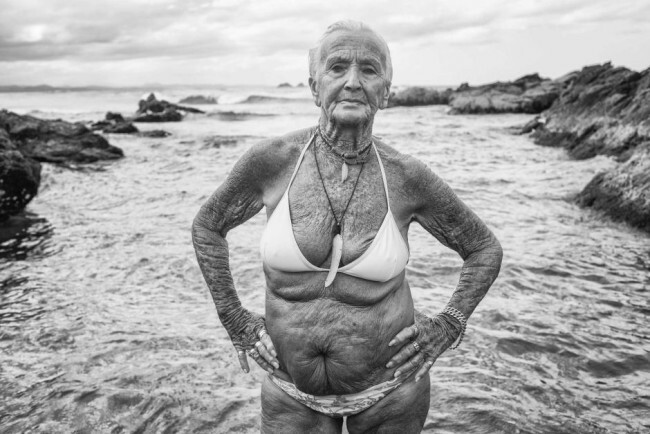 It is a photograph of a woman in her mid-70s who is defying narrow beach body standards by simply being herself and rocking her confidence no matter what anyone else thinks of her! The woman’s name is Feather, and she was capture by Australian award-winning photographer Natalie Grono who entered the photo into the National Portrait Gallery’s prestigious 2015 National Photographic Portrait Prize in Australia. The image, titled ‘Feather and the Goddess Pool’ won the People’s Choice award and ended up becoming the most popular People’s Choice award in the prize’s history. The website says 10,000 people voted for this image during the exhibition’s run “reinforcing the democratic credentials of the prize”. 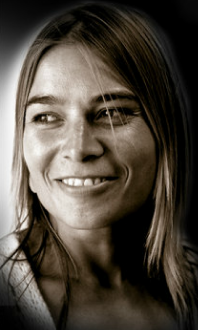 “I am excited that the portrait of Feather resonated with so many people,” said Natalie in a statement about her win. Feather, the subject in her photo, swims in what is called the Goddess Pool in the coastal town of Byron Bay in the state of New South Wales. Natalie told Hello Giggles in an interview that she was drawn to Feather because of her unwavering confidence which was a strong message despite the immense pressure society and the media puts on women when they appear at the beach or in a bathing suit. Natalie wanted her image to call into account the standards put on women’s bodies while also sending the message that beauty is reflected in all women, no matter what their size or appearance is. “I think the image resonates with people because it invites them to examine a confident elderly woman who is proud of her body. She is not afraid to show the lines that inscribe her life story. It confronts the viewer’s impressions of beauty, as opposed to a culture where we are saturated with imagery of young models wearing bikinis,” Natalie said. Natalie told the Hello Giggles team that this image is part of a larger body of work based around womanhood, where she is focusing on a particular group of strong, confident and creative women who live in the Byron Bay area. So why do we love this image and the fact that a photographer won a coveted award with it? Because it sends a huge message not just to audiences, but also to the industry that the power of the democratic voice, as the National Portrait Gallery so eloquently put it, should be the determining factor in setting standards of beauty today. Natalie shared three more images with Hello Giggles which are from her series on womanhood, one featuring a group of women holding up scarves in a Mad Max-type visual, another of a mom and her two daughters, and a third of a young woman wearing what looks to be tribal headgear and feathers. Just like the image of Feather at the Goddess Pool, we have no doubt there is a powerful story and accompanying message with these subsequent photos.